Back when I subscribed to Oxford American magazine, I would regularly threaten (to myself) to cancel my subscription if I saw one more picture of a snake handler in their pages. Snake handlers and alligators were a little too common as OA’s attempt to capture “Southern-ness” occasionally tilted a little too far toward surreal Southern Gothic. So it is with some trepidation that I feel a need to address the very Southern taste for salted peanuts in Coca-Cola as a snack. This is something I remember from early childhood. We would take a bottle of Coke and a sleeve of salted peanuts. Take a couple of good swigs of the Coke to make room for the peanuts and then slowly pour the peanuts into the narrow top of the Coke bottle. 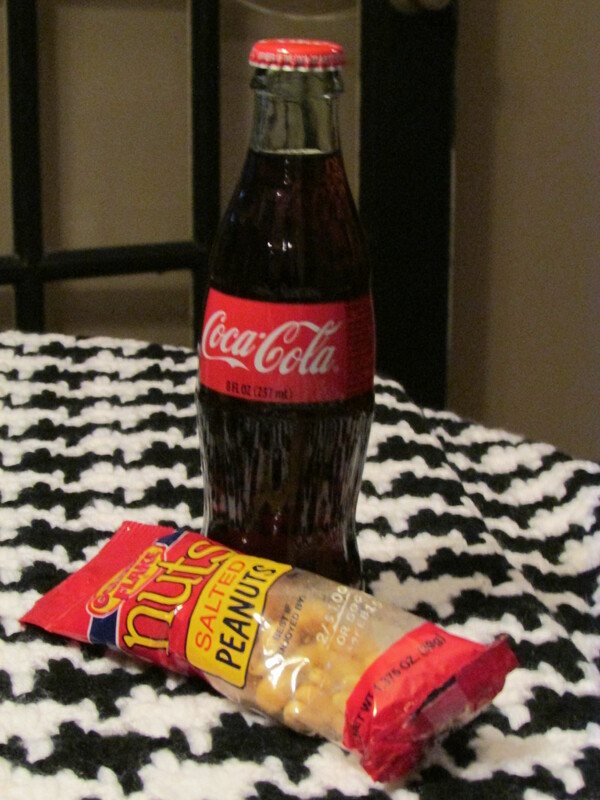 The combination of the sugary Coca-Cola with the salty peanuts is really good. Trust me on this, but don’t ask me to explain why. I had relegated peanuts in Coca-Cola to a distant childhood memory until this summer when Coach Jimbo Fisher of Florida State dumped some peanuts in his Coca-Cola during ACC media days. The non-Southern press in attendance was flabbergasted and felt the need to address this odd behavior in multiple columns which then led to a deluge of online responses, contradictions, and opinions. We Southerners who grew up with peanuts in Coke as a normal treat were a little bemused by the brouhaha. While I suspect that this tradition is more familiar to Baby Boomers and their parents than to younger generations, I asked a recent class of college-age students how many of them had heard of or had peanuts in Coca-Cola and was surprised at how many hands went up. A few of them opted for RC Cola instead of Coke. I can accept that. The resurgence of peanuts in Coca-Cola as a topic of conversation in the 21st century surprised me as much as the emergence of one of my guilty pleasure road treats – fried pork rinds – as a healthier junk food choice (no carbs, high protein, low-fat and a high percentage of the same healthy unsaturated fats as olive oil – go figure). There is a long tradition of Coke in recipes. “Atlanta Brisket” – brisket glazed with cola – has been around for a while and “America’s Test Kitchen” did a version of it fairly recently. “Coca-Cola Cake” is a mainstay of Southern cookbooks and I have seen a Coca-Cola cake with a peanut glaze inspired by the classic peanuts in Coke tradition. Bartenders are constantly upgrading the football Saturday stalwart bourbon and Coke into more sophisticated renderings such as the “Reengineered Bourbon and Coke Cocktail” recently featured in Garden and Gun magazine. Even more to the point, I recently heard that a place in Birmingham has a cocktail called the “Tallulah” which is made of Coca-Cola, peanut syrup, and Jack Daniel’s. An investigation is in order. North Carolina chef Vivian Howard, in an episode of her PBS show “A Chef’s Life,” explored the North Carolina tradition of putting peanuts in Pepsi. I have a lot of respect for Chef Howard and she is a wonderful chef, but this will not do. Howard’s Pepsi and peanuts exploration did, however, lead to what looked like a great recipe of Pepsi-glazed pork belly with country ham braised peanuts. I bet it would be even better with a Coke glaze. After teaching a Saturday class in Huntsville this past weekend, I hopped in the car to drive to Birmingham for a quick visit. Stopping for gas outside Decatur, I spotted an 8 oz. Coke in a glass bottle in the drinks case. I grabbed it and a sleeve of Golden Flake salted peanuts and headed to the car. I downed a few gulps of the Coke, emptied the peanuts into the bottle, and headed south on I-65 listening to the radio and the pre-game shows leading up to the Alabama-Ole Miss game. It has been at least forty years since I indulged in peanuts in Coca-Cola. I was transported back to football Saturdays growing up and “The Bear Bryant Show” on television each Sunday after game days. Coca-Cola and Golden Flake potato chips sponsored the show (“’Great pair’, says The Bear”). It was an exhilarating drive. This entry was posted in culture, food, the south and tagged Coca-Cola, food, peanuts on October 6, 2014 by gedwardjourney.